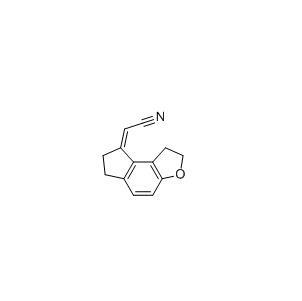 (1, 2, 6, 7, -Tetrahydro-8H-indeno [5,4-b] furan-8-ylidene) acetonitrile CAS NUMBER IS 221530-44-5 which is advance intermediate of Ramelteon, Molecular Formula is C13H11NO, MW is 197.23254,The quality standard of purity is more than 98% ,if there are specific quality requirements, please communicate with us before quotation, different quality requirements corresponding to different price levels, if not provide quality requirements will seriously affect the accuracy of quotations. As the product market demand is small, the reaction step is long, pollution and other reasons, we generally keep our inventory at kilograms. Dozens of kilograms of orders for delivery time is generally 1 month. we have many years of production experience for the key intermediates of Ramelteon cas 221530-44-5, we can also provide a large number of its upstream intermediates . Looking for ideal 221530-44-5 Manufacturer & supplier ? We have a wide selection at great prices to help you get creative. All the CAS 221530-44-5 are quality guaranteed. We are China Origin Factory of CAS NUMBER 221530-44-5. If you have any question, please feel free to contact us.